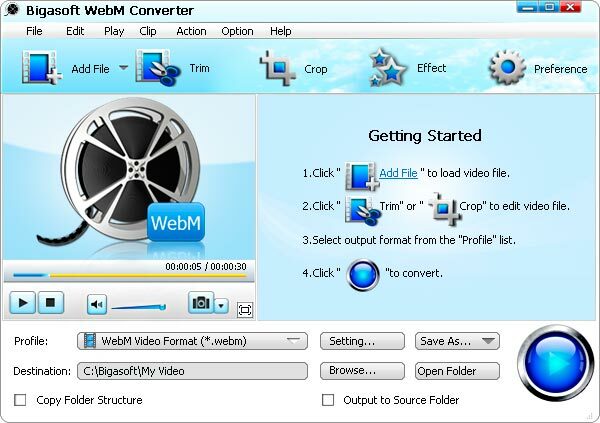 Bigasoft WebM Converter, the well-known WebM/VP8 encoder and decoder, helps easily create WebM/VP8 video from any video format as well as convert WebM to other video format. It can encode and create HTML5 supported WebM/VP8 format from any video format including MP4, MOV, AVI, 3GP, FLV, H.264, MKV, WMV, RM, RMVB, VOB, Xvid, DivX, HD, AVCH, MTS, TS, etc. It can also decode and convert WebM/VP8 to popular videos such as MP4, AVI, H.264, and more. Create WebM/VP8 from any format video and convert WebM/VP8 to various videos. Furthermore, the ideal WebM converter is endowed with advanced functions. It allows extracting music from WebM/VP8 and saving as OGG, MP3, AAC, AC3, WAV, WMA, etc. You can also achieve preferred editing like previewing, snapshot ting, trimming, cropping, merging, adjusting output size, and converting files in batches and more to meet your personalized needs. It enables you to trim off undesired video segment. You can easily crop the picture frame of your videos to remove black bars or unwanted area and focus video by the video to WebM converter. It can merge different source videos as an integrated video file. Select as many chapters as you like and it will automatically convert them one by one. Qweas is providing links to Bigasoft WebM Converter 3.5.10.4312 as a courtesy, and makes no representations regarding Bigasoft WebM Converter or any other applications or any information related thereto. Any questions, complaints or claims regarding this application Bigasoft WebM Converter 3.5.10.4312 must be directed to the appropriate software vendor. You may click the publisher link of Bigasoft WebM Converter on the top of this page to get more details about the vendor.